Transfer Punch Set, 28 pcs. iGaging 36-728 - Transfer Punch Set, 28 pcs. 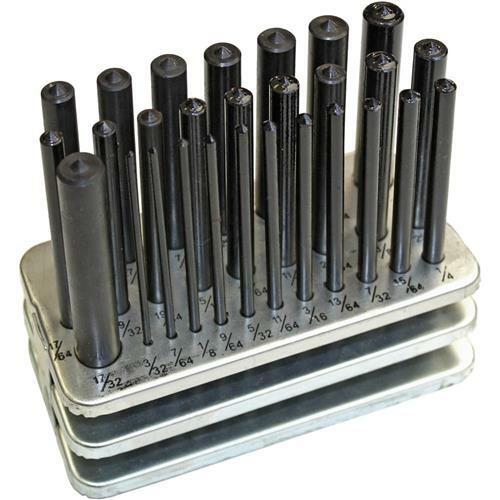 Features:28 piece transfer punch set with standHardened and tempered tool steel with black oxide finishAll sizes are marked, range from 3/32" to 1/2" by 64th and 17/32"
All sizes are marked, range from 3/32" to 1/2" by 64th and 17/32"
This is a very nice set.. The punches came coated with a substance to keep them from rusting, which I cleaned off with alcohol. This is a great addition to my workshop. As advertised. Fast delivery. Not much to go wrong with transfer punches.